New Construction? Why Wait? We have something better! Are you considering a new construction home? Are you willing to wait six months for construction completion? Are you aware of the high costs associated with home upgrades? While building a new home can have great appeal, many buyers are caught unaware by sudden cost increases. 8801 Eli Drive, Louisville, KY 40291 combines the crisp modern design of newer construction with a multitude of upgrades inside. When constructing a new home, buyers typically purchase a base home construction package and then have the ability to upgrade flooring, lighting, fencing, and decorative finishes. When its possible to find a newer home that already contains these upgrades, the savings can be astonishing! 8801 Eli Drive, Louisville, KY 40291 easily contains over $15,000 in upgrades including an already fully fenced back yard, sparkling high end flooring, attractive lighting additions, as well as window treatments and decorative molding throughout! Priced at only $93 a square foot, this home is truly your best buy in the fast growing Cedar Glen subdivision. Homebuyers desiring a country setting with easy access to expressways and shopping will quickly fall in love with the large green lots and family friendly lifestyle in Cedar Glen. New residents in Cedar Glen have the wonderful ability to choose a previously constructed home or to consider having a new home built. Why buy new when you can move in now and enjoy all of the upgrades without additional costs? This home is an amazing steal! Don't miss your chance to see it! Give us a call to schedule your showing today! 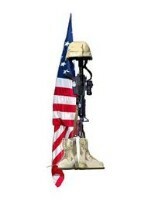 Happy Memorial Day 2012! Its hard to believe that May is already drawing to a close. Schools are letting out for the summer and the rising temperatures and sunny days have most Louisvillians dreaming of barbeques, pool parties, and summer vacations. What better way to remember our fallen heroes than to spend some relaxing quality time with family and give thanks for our blessings. Louisville residents have many choices of activities during the Memorial Day Holiday weekend. This Friday the 25th is the monthly F.A.T. Friday Trolley Hop for shopping, entertainment, and food. On Saturday afternoon, you can journey down to River Road for the Kentucky Reggae Festival with live music, vendor market, and jamaican cuisine! Abbey Road on the River, the world's largest Beatles inspired music festival will be landing in Louisville Kentucky again this year and performances can be seen in various downtown venues this Thursday May 24th-Monday May 28th. Nickelback will also be performing at the Yum Center on Saturday evening and there is a Saturday evening Louisville Bats homegame at Slugger Field. Physical fitness enthusiasts will enjoy gathering downtown at Waterfront Park at 8:30am on Memorial Day Monday for the Annual Mayor's Hike, Bike, & Paddle. 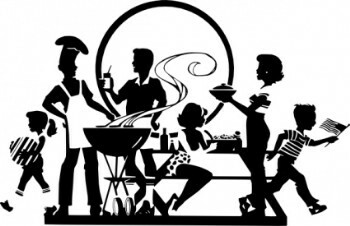 Whether you choose to get involved in one of the many public celebrations or spend a quiet day with family at home, we wish you a wonderful and restful Memorial Day weekend! The Lynn Thomas Team is excited to invite you to a Cedar Glen Neighborhood Open House this Sunday May 20th from 2:00-4:00pm. The below homes will be open for showings during this time period and ready to welcome guests. Keller Williams Realty Louisville East and Semonin Realtors will be hosting. 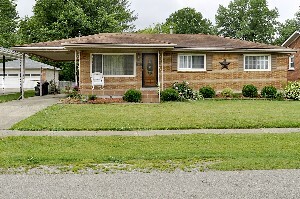 1310 Rhonda Way, Louisville, KY 40216 is an inviting brick ranch on a fabulous lot in Cloverleaf. The home has three Bedrooms and 3 Full Bathrooms and lots of square footage for your comfort. The Living Room at the front of the home is sunny with artistic crown molding, sparkling floors, and neutral decor. The Eat-In-Kitchen conveniently opens to both the Living Room and a large Family Room. 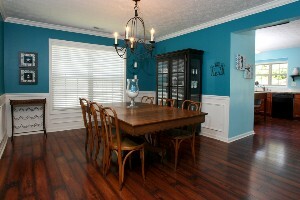 What a great layout for parties and mingling with house guests! The kitchen is quite pretty with nicely finished cabinets, stainless appliances, attractive tile work, and a breakfast bar. The Family Room is highlighted by recessed lighting, a tray ceiling, and crown molding. 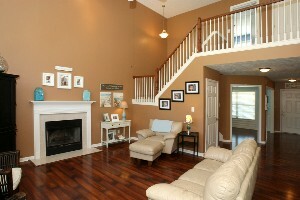 The Family Room also exits to the back Deck and Above-Ground-Pool. The main Bathroom has a white ornate vanity and matching medicine cabinet. Crown molding accents the Master Bedroom which is connected to a tranquil Master Bath with whirlpool and separate shower and a Walk-In Closet. Two generously sized secondary bedrooms and a laundry room complete the first floor. A second walk-in Laundry is located in the basement! 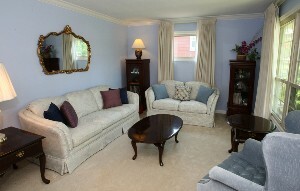 The basement also contains another Family Room, a Full Bath, a Work Room, and two additional rooms. Future owners will love this back yard! 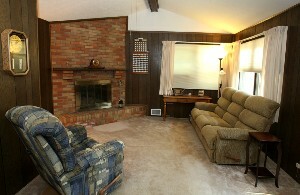 It is spacious for games and entertaining and has a pleasant shade tree. The Deck is large enough for a grill and connects to the 21' round above-ground pool. There is awesome additional storage in the 12 X 12 shed as well. A two vehicle car port is attached to the home. 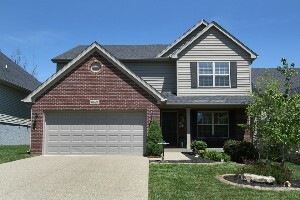 1310 Rhonda Way, Louisville, KY 40216 is completely move-in-ready and waiting to welcome you home. Call today if you would like more information about this home! Experience the comfort and convenience of one story living at 6009 Applegate Ln., Louisville, KY 40219, a fantastic 3 bedroom brick home in Louisville. The front yard is well maintained and the home includes a large driveway, easy turnaround area, and a one and a half car detached garage. Soft decor, crown molding, and three windows for natural light highlight the Living Room. The vaulted wood beamed ceiling and floor to ceiling bricked fireplace in the Family Room provide a cozy environment for entertaining or enjoying a quiet evening at home. The Kitchen offers lots of counter space and enough space for a nice dining table. Both the full and half bath have exterior windows and the Full Bath includes a large vanity area. The Master Bedroom is inviting with neutral colors, large ceiling fan and bifolding closet doors. Both secondary bedrooms are spacious and one is presently being used as an office. The walk-in laundry and utility room completes the floor plan. 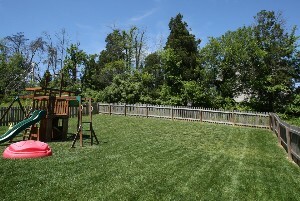 The back yard is fully fenced with a wood privacy fence. There is a spacious grassy area with room for playing games or planting a garden. The maintenance free exterior adds extra appeal. 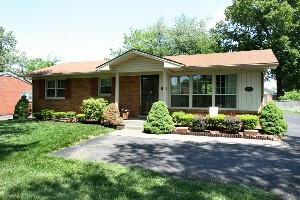 6009 Applegate Ln Louisville, KY 40219 has been lovingly cared for inside and out. The home is located in a great neighborhood with easy access to interstates. Several updates have been made recently such as double pane replacement windows and a newer furnace. Give us a call today to schedule a showing! 8801 Eli Drive, Louisville, KY 40291 is an immaculate two story 3 bed, 2 and 1/2 bath Louisville Home. The front of the home is meticulously landscaped with a covered front porch. the home features an open floor plan and spotless interior. The Front Entrance is attractive with neutral walls and leads to a beautiful bright office with wainscoting, crown molding, and textured ceiling. An extra large Formal Dining Room is also highlighted by wainscoting, crown molding, and a bronze chandelier fixture. 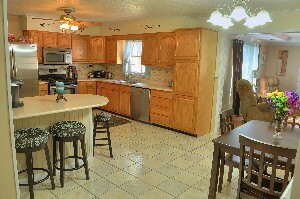 The home has a wonderful Eat-In Kitchen with plentiful cabinet and counter space and black appliances. Double doors exit the kitchen to the back patio. The Great Room is two stories with the stairway and hallway to the upper floor overlooking the sitting area. A vaulted ceiling and handsome fireplace with marble surround creates a lasting impression. The Master Suite is fresh and inviting and showcases a vaulted ceiling, plant ledge, and walk-in closet. The Master Bath contains a double vanity, soaking tub, separate shower, and water closet. 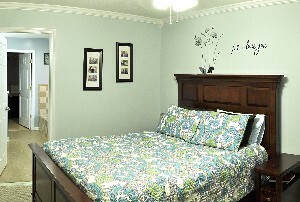 The secondary bedrooms are sizeable with large closets and are connected by a Jack n Jill bath. The Laundry Room is positioned on the second floor near the bedrooms for added convenience. The Back Yard is fully fenced with a large patio and a mature tree line just beyond the property line. Future owners can enjoy space for outdoor dining and entertaining. 8801 Eli Drive, Louisville, KY 40291 is an amazing find in Louisville Real Estate! The beautiful interior design combined with the fabulous layout, 2 car attached garage, great back yard, and convenient location make this a true steal. Give us a call to see this wonderful home today! The At Home in Louisville Group took such good care of us! I think that they have assembled a dream team. When you sign with them, you get the best. Melanie Jones is a Godsend and a wonderful agent. She was incredibly focused on finding our family the perfect home. We relied on her experience during this process and I cannot imagine doing it without her help. She goes above and beyond to give priority to her clients and I feel grateful to have had the opportunity to work with her.